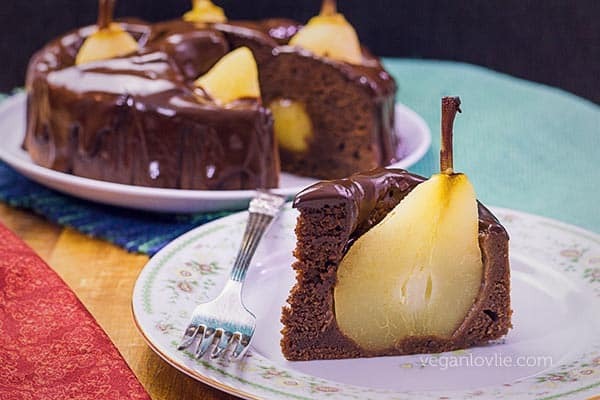 Chocolate and pear lovers should find much joy in this cake — whole sweet juicy California Bartlett pears cushioned inside deliciously moist and mellow chocolate cake with a beautiful chocolate ganache glaze. This cake is quite simply … marvellous! Every bite is delightful. 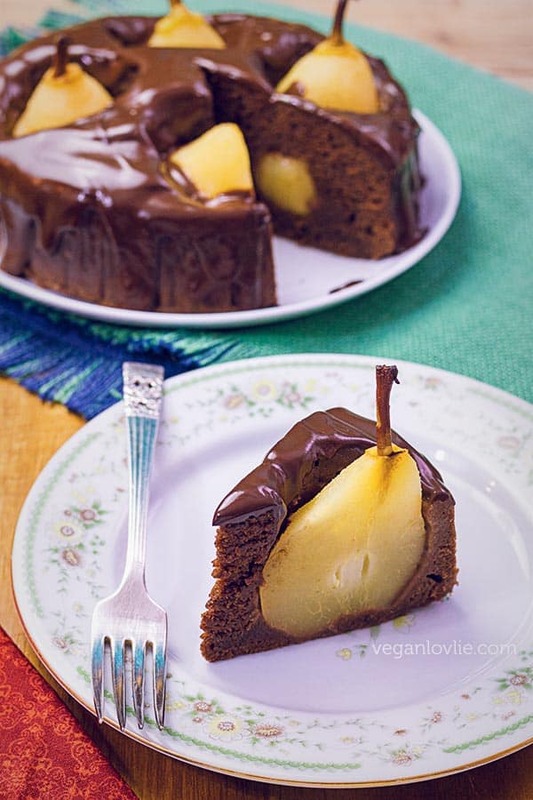 This Whole Pear Chocolate Cake is steamed in a pressure cooker and is an ideal cake for the summer months. 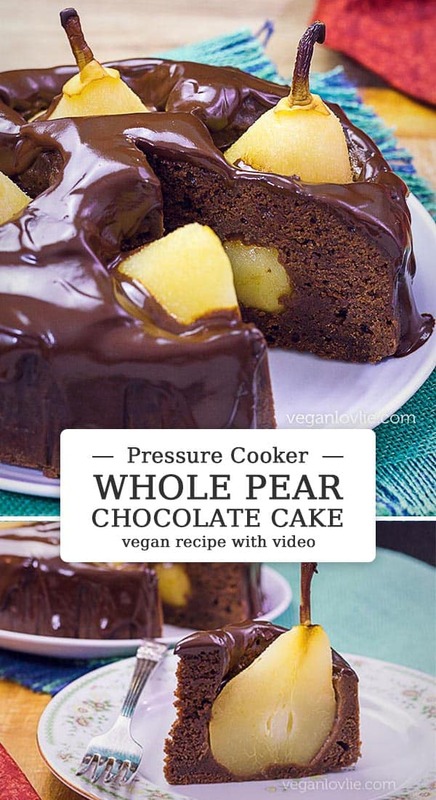 [Recipe features electric / stovetop pressure cooker and baking options]. This post is sponsored by California Bartlett pears. For full disclosure, please read below at the end of the post. 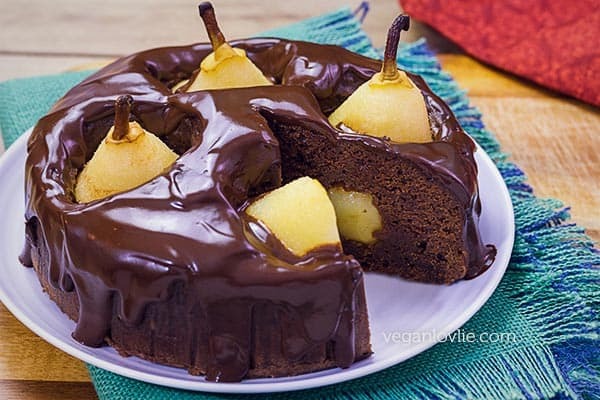 California Bartlett pears are the ideal variety of pear for this cake. When ripe, Bartletts are among the sweetest and juiciest of all pears which is why I love them so much for dessert recipes. They are available for several weeks in July and August in Canada. When it comes to eating them raw as a healthy snack, pears are often underlooked compared to apples or bananas. 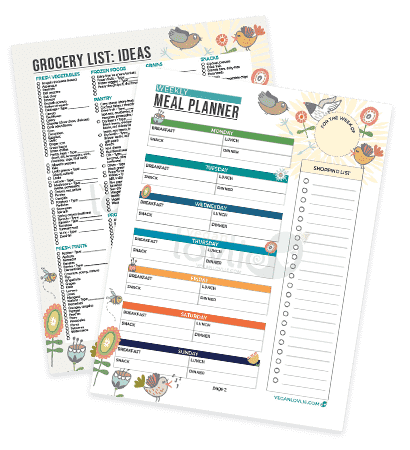 For my part, I much prefer raw pears to apples or bananas which seem to be among the most popular snack or lunch box fruits. 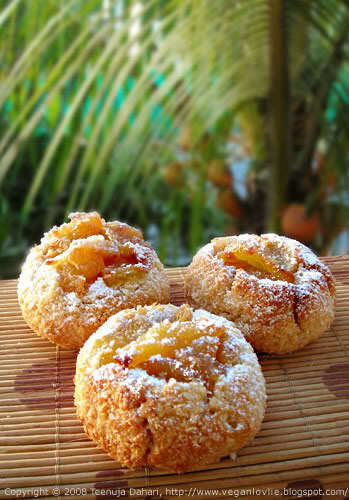 In fact, I don’t really buy apples if I am not baking with them. But pears are a different story. They are my go-to fruit snack at any time of the day. I just love their ambrosial fragrance and texture. If I am eating them raw, I love them semi-ripe. On the nutrient profile, they contain antioxidants, and are a good source of fibre, and a source of Vitamin C, potassium and folic acid. When they start becoming too ripe to eat, they go into all sorts of delicious desserts like this Pear Custard Pie or this Pear Coconut Creme Caramel Custard. 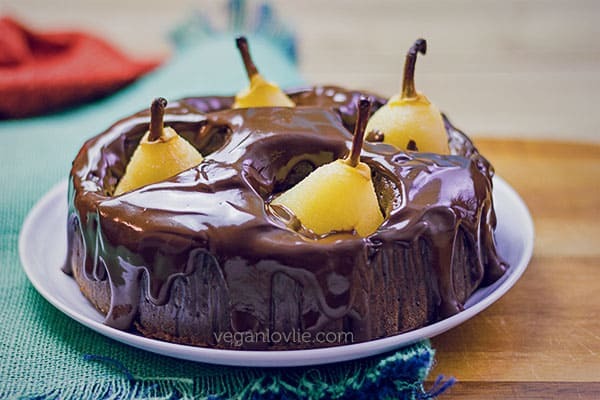 And in today’s Pear Chocolate Cake that can be made in a pressure cooker during the hot summer months. I’ve become quite a fan of this cake. Look for firm, well-shaped fruit. You may wish to buy a mix of green pears to ripen at home if you want to eat some. I personally prefer semi-ripe pears for eating. When the pears are at their peak ripeness, they are golden yellow and can be enjoyed immediately or are ideal for cooking and baking. 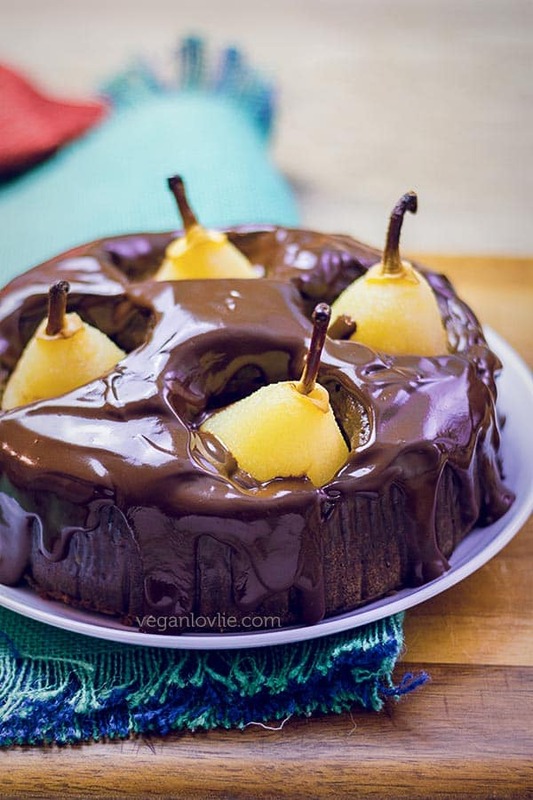 For this particular recipe, I suggest using slightly smaller pears so that you can fit them nicely into the cake pan and get half a pear in each slice. Pears can be ripened at home in a bowl at room temperature. When California Bartletts are green and firm, they will take four to six days to ripen on their own. When a Bartlett is golden yellow, it is fully ripe and at its juiciest, most flavourful stage. This is the ideal stage for this recipe. Because pears ripen on the outside last, by the time the outside is soft it’s overripe. So, to test for ripeness, put gentle pressure on the top of the pear near the stem. If it gives way a little, then it’s ripe. Minor blemishes do not affect the flavour or quality of the pear. Since these pears can spoil easily, you may want to refrigerate them to preserve or slow down their ripening process. Refrigeration will hold their ripeness for another 3-5 days, just in case you don’t have time to make this cake when you had planned to. Once cut, peeled or sliced, pears will start to brown. To prevent this from happening, I usually just rub them with a slice of lemon. You may also dip them into a mixture of 1 tablespoon (15 mL) lemon juice and 1 cup (240 mL) water. To remove the skin, hold the pear firmly in one hand and using a sharp paring knife, carefully remove the outer layer of skin as thinly as possible. I like to use a vegetable peeler but the blade needs to be very sharp, otherwise it will just crush the pear especially if it is very ripe. 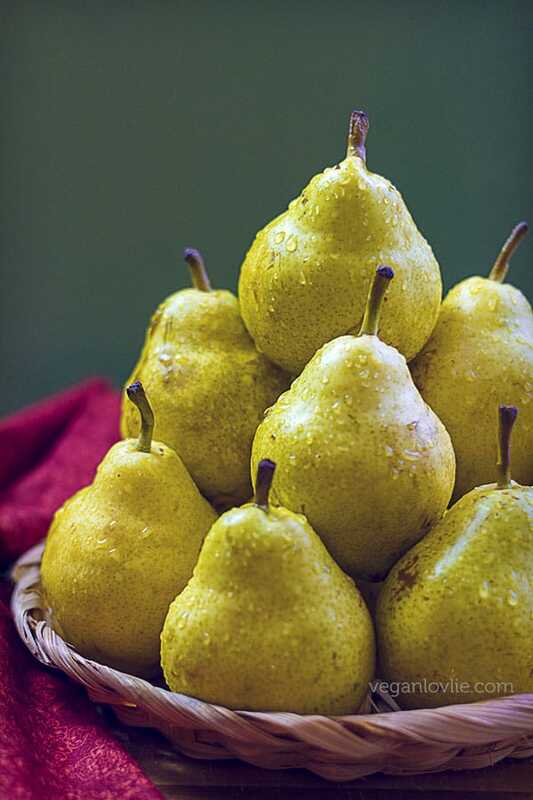 Bartlett pears have such a tender skin that it is not even necessary to remove it for baking. 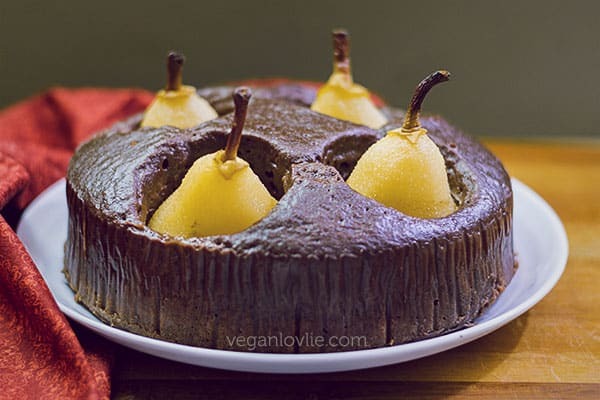 However in this recipe, I do find that peeling the pears result in a much nicer texture inside the cake. 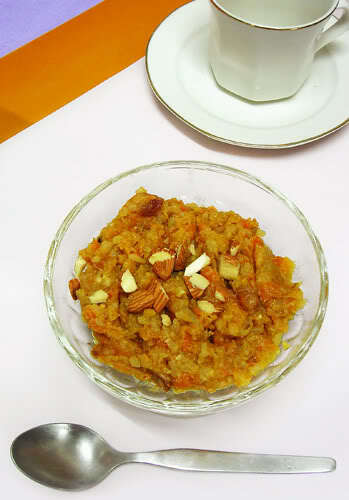 The video below shows best how to prepare the cake pan for this recipe. Line the bottom and side of the pan with parchment paper. For the side, leave a slightly taller collar around. This is to create more height in case the cake rises more. If your mould is quite tall, then the extra height is not necessary. Make a ‘lid’ with parchment paper or aluminium foil to cover the pan so that the steam does not drip back on the cake and make it soggy.. Note: if you are baking this cake, you don’t need the lid. 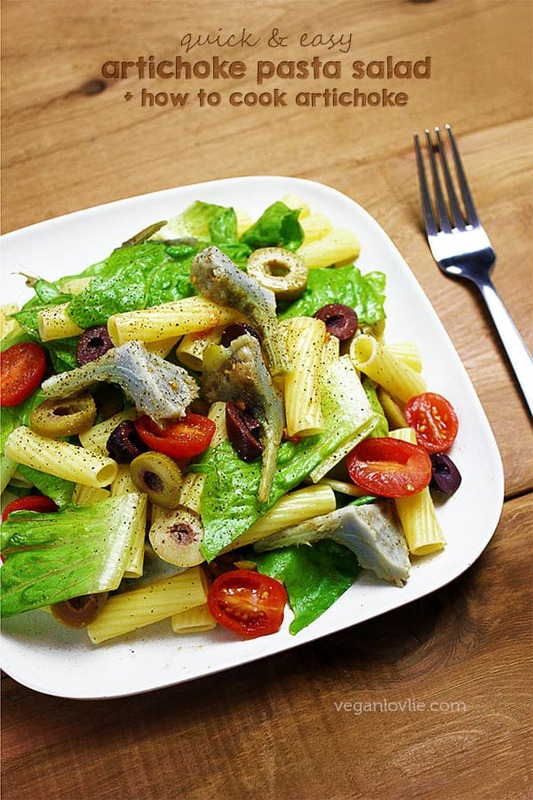 If you are using aluminium foil, just cover the pan and press the foil around so that no steam can get in. If using parchment paper, you need to shape it so that it wraps tightly around the pan. To do this, trace around the pan on some parchment paper. Then extend the circle diameter by about 6 – 8 cm. Cut around this larger circle. Snip into the circle from the edge towards the centre and stopping at the inner circle at regular intervals all around. Fold the snipped pieces of paper along the inner circle (size of pan). Staple each of the folded pieces together at the bottom to make a straight edge around the circle and the lid is done. We will also need 2 pieces of string, each about 4 times the width of the pan. This will be tied around the pan and serve as a handle which will make it easy to lower the pan in the pressure cooker and then later remove it. For smaller pressure cookers, use a 15 cm / 6-inch spring-form cake pan. (Measure the diameter of your pressure cooker to be sure). Cotton twine or other piece of strong string – 2 pieces, each 4 times the width of the pan. This will help to create a handle. Cover the pan with the parchment paper ‘lid’ and tie the strings around the pan to make a handle (as shown in the video). After the time is up, let the pressure go down naturally, i.e. do not quick release it. This will take about 20 – 25 minutes. Once the red indication is down in the ‘safe to open’ position, open the pressure cooker. Baking instructions: Bake in a preheated oven at 180C / 350F for 40 – 45 minutes or until a skewer inserted in the middle comes out clean. This cake will keep in the refrigerator for 3 – 4 days and it is even tastier the next day. 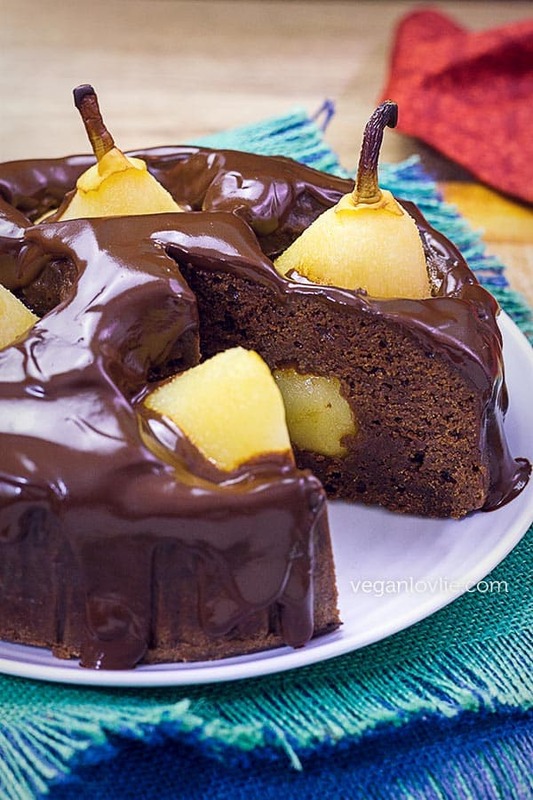 Pin this gorgeous Pear Chocolate Cake recipe for later. Full disclosure: This post is sponsored by California Pears. We only endorse products and services that we like, enjoy, use and that we believe, based on our experience, are worthy of such endorsement. We value the trust of our readers and subscribers. We believe in honesty of relationship and opinion. The views and opinions expressed on this blog are 100% ours.